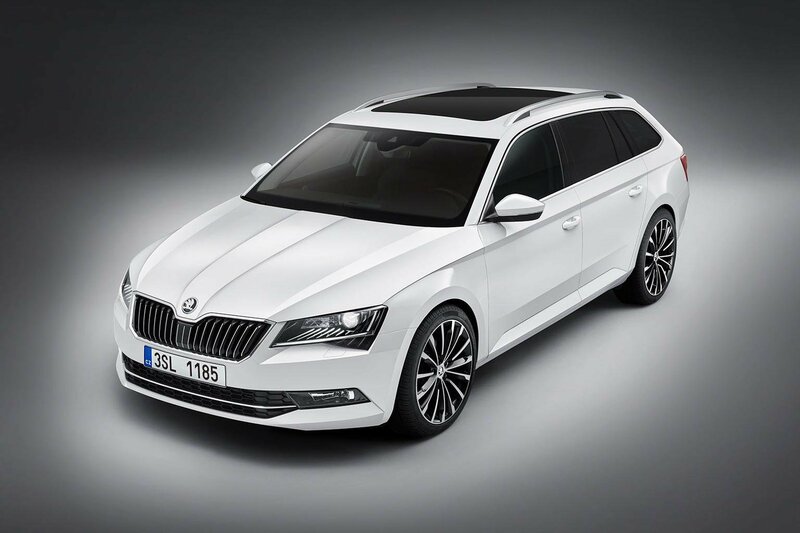 2015 Skoda Superb estate - pictures, specification and on-sale date | What Car? The 2015 Skoda Superb estate goes on sale later this year with prices starting at £19,840. The Skoda Superb Estate is a large family estate car and the new version makes its public appearance at the 2015 Frankfurt motor show. Known as the Superb Combi in the rest of Europe, it goes on sale two weeks after the hatchback in late September 2015. Skoda UK sells more of the current Superb estate than it does the hatchback, and this is expected to remain the case with the new model. The new model is set to be even more vast than the one it replaces. With a standard boot capacity of 660 litres, and a colossal 1950 litres with the seats folded, it even eclipses the enormous Passat Estate for cargo stowage. The Skoda Superb comes with a range of petrol and diesel engines. The petrol line-up starts with a 148bhp 1.4 TSI which is available with a choice of automatic or manual gearboxes. A pair of 2.0-litre petrols with outputs of 217bhp and 276bhp are also in the line-up and are available automatic gearboxes only. The 1.4TSI 124bhp version offered in the hatch is unlikely to make it to the UK. The best-selling engines in the range are likely to be the diesels, all of which are available with a choice of automatic or manual gearboxes. There's a 1.6-litre diesel with 118bhp and the option of a manual or automatic gearbox, and 2.0-litre models with outputs of either 148bhp or 187bhp. Both outputs are available with the option of four-wheel drive, although only with a manual gearbox. All models have a reasonable level of specification, but the extra comfort of SE models over the basic S is good value. SE models get a larger touchscreen, adaptive cruise control, lumbar support for the front seats, folding mirrors and rear parking sensors. The SE Business model is the lowest specification that includes sat-nav. The Superb Estate will cost around £1200 more than the equivalent hatchback model when it goes on sale, with the range starting at around £19,840 for a petrol-powered S trim model. SE models, which are likely to be the best sellers, start from £22390. Range-topping Laurin & Klement models start at £31,840. The Superb enters into a class that is filled with a fair amount of new cars at the moment. The Volkswagen Passat has just been replaced, as has the Ford Mondeo. The Passat earned a five-star review from our road testers, while the Mondeo is not far behind with four out of five. The Passat is praised for its all-round ability, matching a luxurious interior with a comfortable ride and impressive refinement. It is criticised for being a little pricey, though, with is something on which the Superb has always been competitive. Discounts are unlikely straight off the bat, but Skoda is generally generous with offers. We'd expect savings to be available once the car is on sale up to around 10%.